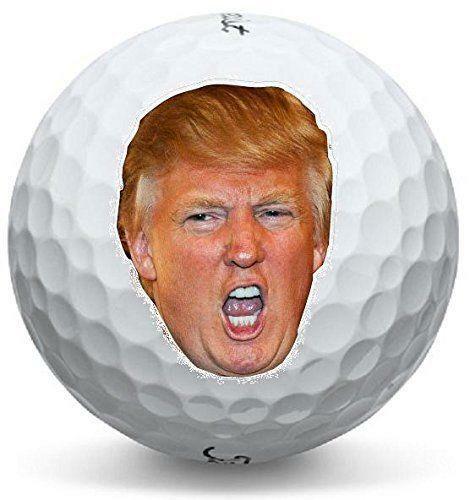 Donald Trump UUUGE Expression Titleist Pro V1 Golf balls. Each golf ball will have the same logo as per picture. • This 1 Dozen pack of unique printed golf balls will help you look like a pro even if your game is over par.Each golf ball is professionally printed with the design, and will look great on the green or in the rough.Treat yourself, or make this pack of golf balls a novelty gift for Father's Day, retirement, or no reason at all!We offer 100% money back guarantee, so you can buy with confidence. Your satisfaction is our promise, and returns/exchanges are made easy.Professionally Packaged.